JENKINS TWP. C Even to this day, some still won’t go near the Susquehanna River at Port Griffith because of what happened there nearly 40 years ago. The Knox Mine Disaster is still with us, Robert P. Wolensky, an area native and a sociology professor at the University of Wisconsin, said in an interview last April. On Jan. 22, 1959, water broke into the Knox Mine in the village of Port Griffith. Twelve men were killed. Their bodies were never recovered. The tragedy ended most mining in the area and changed the future of the Wyoming Valley. Before the disaster, the anthracite industry appeared well on its way to recovery. Alter years of depression, thousands of miners and laborers were working again in large and small coal operations. Stable and steady work looked assured, The Times Leader, The Evening News reported on the one-year anniversary of the disaster. The Knox Coal Co. changed that when It ordered miners to dig too close to the Susquehanna River bed. Around noon on Jan. 22, flood waters from the Susquehanna broke through the thin rock cover into the underground workings of the mine. 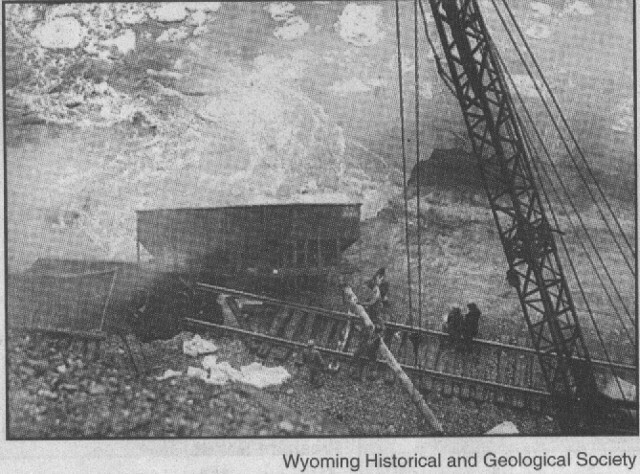 The water flooded mines throughout the area and trapped the miners. Of the 69 survivors, 33 were stuck in the mine for up to several hours. A hero did emerge from the flooded mines. Amedeo Pancotti of Exeter led 32 men to safety. Alter helping to dig through 30 feet of debris, Pancotti volunteered to scale a 50-foot wail to the surface where he called for aid. He received several medals for his heroics. At one point, in an attempt to plug the hole between the river bottom and the mine, railroad coal cars were fed Into the swirling funnel of water. It was soon clear that the river had filled the mine. Some said all the miners had been rescued, but when families went to the Pittston Hospital, where the miners were taken they found two lists C those who escaped and those who were missing. Two days after the disaster, a five-man team of civilian deep-sea divers arrived. On Jan. 26, efforts began to pump millions of gallons of water from the mine, although it was suspected the 12 missing men were not alive. On Jan. 31, pumping operations stopped as a huge cave developed near the Lehigh Valley Railroad tracks which were a short distance away from the river. More pumps were delivered to the scene, but attempts were halted for good on July 24. In March of that year, the Port Griffth Disaster Fund Committee $500 dollars to each family of the 12 victims. Investigations and lawsuits soon followed. On May 11 warrants were issued for seven mine officials who were charged with violations of the Anthracite Mine Act. In September, the Luzerne County Grand Jury indicted seven for involuntary manslaughter. Three of them were charged with conspiracy. The few convictions, however, were overturned on appeal. In an interview last April, Audrey Calvey, whose father, John Baloga, was one of the twelve victims, said " it bothers me, because I wonder where his body is, how long did he suffer, how long did it take the water to reach the top." The others who remained in the mine were: Frank Orlowski, William Sinclair, Francis Burns, Dominick Koveleski, Donald Stefanides, Herman Zelonis, Benjamin Boyer, Charles Featherman, Joseph Gizenski, Eugene Ostroski and Samuel Altieri. In his book, " The Wyoming Valley: An American Portrait" Edward F. Hanlon wrote " that disaster insured a future for the Valley that would be substantially different from its past. For better or worse, men would no longer descend into pits under Wyoming Valley."